It is precisely through the evil inclination that a person makes contact with the Creator. The evil inclination is the mediator, the connector between man and the Creator. This is the only reason why man would need it. We might lead an entire life without needing anything, until we try to nurture love of others, and then we see how impossible it is. Some people recognize the merit of love of others out of their own feelings. It is a drive for something spiritual, to discover the meaning of life, its purpose, it essence. Others achieve love of others through suffering, hopelessness about life, or an overall crisis, as we are now seeing the world over. These people search for a way out of the plight they are in, and discover that the world has become global, integral, and that the only choice they have is to connect to others in a reciprocal manner, or else they might be left hungry the next day. This fact is becoming increasingly evident. Some people discover it through an inner drive, and some are pushed to it by suffering. But sooner or later all of us will have to connect to others in mutual guarantee, even just to obtain our sustenance. We are discovering that connection is impossible. Our nature is preventing us from connecting to others, as if it is failing us. We are beginning to recognize that there is a higher governance here, that the Creator, the upper force, is not letting us do anything. At that time the three of us—me, my evil inclination, and the Creator—begin to work together, like Moses in Egypt. It is written, “Come unto Pharaoh; for I have hardened his heart” (Exodus 10:1). Moses, the Creator, and Pharaoh, all work together in us. It is how we advance. We discern the evil inclination, the help made against us, and we have no choice because specifically with its help does one turn to the Creator. Were it not for the evil inclination, we would never turn to the Creator, we would never discover Him, and we would never need Him. We advance through corrections made on our evil inclination, while increasingly connecting through it to the Creator. The more attached we become to the overall force of bestowal and love that governs the world, even if it is hidden, the more we become exposed to it and attribute it to ourselves. We learn to use our evil inclination, and eventually gladly relinquish it because it was created in order for us to obliterate it. In this portion we are reaching a greater level of Aviut (thickness) of the evil inclination, expressed in the aforementioned special Mitzvot. A Mitzva is a correction of the evil inclination. Our evil inclination is divided into 613 egotistical desires that we must correct into having the aim to bestow upon others, into love of others. In this portion we are dealing with the biggest, meanest, and heaviest desires. Although it seems that we meet these desires only rarely, in truth, only once we have made many lighter corrections do we come to meet the evil inclination in us that requires this type of corrections. It follows that the Mitzva concerning a rebellious son, the sending of the bird, and the blotting out of Amalek are the toughest Mitzvot. It is truly our stony heart, the foundation of all the evil. This forms our final contact in our eternal connection with the Creator, as man and the Creator connect together, “Israel, the Torah, and the Creator are one” (The Book of Zohar, Beresheet (Genesis), item 85). This is expressed in absolute love toward others; as it comes from the Creator, so it comes from the creature. This is the goal. What does it mean, a rebellious son? Ben (son) comes from the word Mevin (understanding). We do things without recognizing, understanding, or feeling them. We must correct our egos—the will to receive that is expressed precisely between us and others—absentmindedly, without quite knowing the nature of that correction. We do not know what it means to bestow or to not bestow, and we only notice that we do not have good connections with others, and that hatred and rejection are arresting our progress in spirituality and corporeality. We see that our lives are quite miserable, and we have no idea what might happen tomorrow, which brings us to the need to correct our relationships with others. When we correct the relationships between us, we do something that is above our reason, even against it, because by nature, we have no desire for it: We ask for correction against our will. We are willing to love others even though we feel no need for it. This work is called “work above reason,” where we do not understand what we are doing or what is happening. When one works against one’s will, it is considered achieving understanding because once we correct, a new reality truly opens to us, where we see and feel in all our senses, in our minds and in our hearts. That degree is called Ben (son), Mevin (understanding), because then we understand the situation, we feel it, and control it. So what does a “rebellious” son mean? It is a situation in which one does not want to know one’s next degree and does not want to correct oneself. It happens when there is something within that resists the correction so fiercely that one cannot overcome that rejection. Sometimes there are sons who are obstinate whatever we do. On the one hand, he is your son, but on the other hand, there is nothing you can do with him. In that state the son needs to be brought into correction the way the Torah describes. Today it is very difficult for parents and children to communicate, and the same is true for teachers and students. There is a big gap. Yes, especially today, because we are approaching the generation of correction. We are beginning to discover our true nature, which is truly an evil inclination. We see it within us; we are discovering how cruel and inconsiderate we are. We hardly get along with ourselves, not to mention with our partners, our children, and in general. This is who we are today. However, it is not our fault; it is our nature, which is appearing in this way. We feel it in our children, too. But it is precisely these conditions that bring us to correction. It is called “Pharaoh bringing the children of Israel closer to the Creator.” Our evil inclination helps us recognize that it is no longer possible to continue without putting things in the proper order. This portion mentions divorce. Today the number of divorces is nearing the number of marriages. It has passed it. In Europe, fifty-seven percent of the people are divorced, and it is also spreading in the U.S.
Can we do spiritual work with a spouse? We cannot correct the world without correcting ourselves. If we ever want to marry and have a truly good and solid family, we need to see to the correction of couples. But first, we ourselves must be corrected. Today it is almost hopeless. It is impossible to commit to marriage because it is a contract where the groom commits before the bride, and today it is very hard to commit. These days, men can commit only if they are under the social pressure of certain circles in society. It seems that with a spouse it is easier to correct because a person is hesitant to leave ones’ family. Is this truly a good place to work? We have built many systems that help us get along without a family. We have Social Security, health insurance, old-age homes, etc. Money buys everything, and people can do without the family warmth because they can seemingly buy it. Today we are moving into a world that is far more complicated, where the money will not help us. We are in an economic crisis that demands of us to connect in a friendly way with the environment, with friends, with family, with children and with parents. We do not have all that, and this is the revelation of the evil that will help push us toward correcting our relationships, correcting human nature. We will eventually come to a state where we will feel lost without a family, and we have no family because we have lost the concept of the family along the way. What is divorce in spirituality? Divorce means that a person can no longer correct one’s Malchut, the will to receive, and therefore does not sign a contract with that desire, because as a man, one cannot place oneself over the woman, over the desire that must be corrected. Therefore, a person divorces it. But we know that a greater desire will follow it, so what is the point of the divorce? This is why it is written that divorce is the worst option, that Divinity cries for every divorce. We are all parts of Divinity, and if we cannot correct it, it is as though we are delaying the correction, and this is very bad. That said, sometimes people have that feeling, that understanding that additional corrections are required here. If a man quarrels with his wife and feels that he hates her, and then turns to the Creator and asks for a correction of loving her, is this the way to be corrected? It happens in spirituality. Indeed, a person needs to cope with one’s will to receive. He is bad, he is wrong, and she is wrong, too. But when we know that we have no choice and we must become corrected, we do it. All those Mitzvot are about the inner man and wife; it is a person’s desire to bestow. The strength to overcome is called “man,” and the deficiency that one must correct, that corrupt desire one has found, is called a “woman.” In the connection between them we correct the relationship. A person receives a desire for correction from the inner woman, and the strength to correct from the inner man, who is connected to the Creator. It is written, “A man and a woman, if they are rewarded, Divinity is between them” (Masecht Suttah, 17a). Through those three we correct that relation into the right one. If we correct it, we have performed a Mitzva, and so we continue to the next woman (deficiency), and the next man, and the next deficiency, and again, “A man and a woman, if they are rewarded, Divinity is between them.” Then once again we correct them and perform a Mitzva. 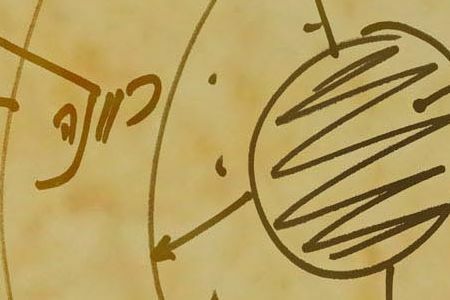 A will to receive with a Masach (screen) and Ohr Hozer (Reflected Light) performs a Zivug de Hakaa (coupling of striking), and the revelation of the Creator arrives within the connection called a “son,” meaning a person acquires understanding, sensation, Dvekut (adhesion). Can it be said that the “me” in spirituality is really the will to receive with the addition of the point in the heart, and we only try to balance them out? The self of a person is the husband and the wife within. We need to know how to work with both of them together so that the self will be similar to the Creator. What is the Mitzva of sending from the nest? It is a very complicated Mitzva. It is quite cruel to drive a bird from the nest and take her eggs. Many books have been written about it, and it is also mentioned in The Book of Zohar, and in the writings of the ARI. We are the Malchut, the will to receive that must be promoted and adjusted to Bina. The “mother” is Bina. The mother of the sons is the mother of the understandings, the attainments. We need to take the eggs from the mother, the future nestlings, and rear them. We do it by connecting to the nest, and performing the Mitzva of sending from the nest. It is considered a Mitzva (commandment—correction, good deed) because once reaching this degree, it is a Mitzva for that person. Sending the mother away is actually detaching oneself from Bina, and working with the ZAT of Bina, a part of her that belongs to the person. That person then takes her and turns the desires of ZAT of Bina, correcting the part of Malchut through them. This is the connection of Bina with Malchut in Tzimtzum Bet (Second Restriction). It is a very big Mitzva. When a person ascends, when Malchut ascends to Bina, Malchut becomes detached from her, and corrects herself. In other words, here, too, as there is a son, there are nestlings, which are the continuation of that quality. Yes, but it is only when one becomes detached from Bina, when one can use part of her to correct oneself. There is the issue that Amalek “jumps” on a person when one is unprepared. Amalek is a big problem. It is essentially the same evil inclination that is in our will to receive. Amalek is really an acronym of Al Menat LeKabel (in order to receive). The Book of Zohar also writes that it is Am and Lek, where Am is from Balaam and Lek is from Balak. When Balaam and Balak conjoin, they build the name Amalek. Amalek is their common root, and this is how they work within us, connected between them. The foundation of the evil in us are Amalek—Balaam and Balak. But this is how we were created. True, it is not from us. From the beginning, the Creator said, “I have created the evil inclination,” so Amalek is from Him. Balaam, Balak, Pharaoh, Hitler, they are all from Him. So who is supposed to blot out the memory of Amalek? It is for man to correct, and to correct so thoroughly that no trace of it will remain. In other words, the whole of the will to receive will come to aim to bestow through the last element, because if anything is left of it, it grows again. Why does Amalek jump them? Amalek emerged from one root, one incident. It is known, even according to what is said in the Torah, that if anything is left of it, it grows within us once again. In other words, until we blot it out completely the problems will not end. Amalek is presented as shrewd. And yet, the essence of the evil inclination, the “Egypt,” the extract of the evil inclination, since Mitzraim (Egypt) comes from Mitz Ra (evil extract), is Pharaoh, and Amalek is a result. Balaam and Balak, however, are its representatives from the sides of male and female. It is still this way today. Is there a distinct expression to the term, Amalek, in the desires of our generation? Amalek is when a person bears such vehement hatred toward the people of Israel, toward bestowal, toward love, that he or she cannot accept them in anyway after all the corrections. A person cannot simply say it. Naturally, none of us want them, but once we correct everything, almost to the end, then Amalek appears. It does not appear prior to it. It is written about it that after all the Mitzvot, after the whole desert, after all that we corrected in ourselves, in connection with the upper light—the Creator—after everything, we have reached the very special and rare Mitzvot in our portion. Only then, in the end, do we arrive at the blotting out of Amalek. But we are talking about blotting out the memory of Amalek. Yes, because we have reached the end of the corrections. Does that mean the worst is still ahead? No. When we enter the land of Israel there is no longer any evil. Here we are trying to turn it into good. Of course we still discover it, but in a different way, in scrutinizing how to connect to others, not how to detach ourselves from the evil in us, but how to connect to others. Let us hope that we will soon return to the real land of Israel, first the inner, spiritual one, the Yashar El (straight to God), that we will all be in united and bonded as brothers.